SSL, a Maxar Technologies company (formerly MacDonald, Dettwiler and Associates Ltd.) (NYSE: MAXR) (TSX: MAXR) has announced that the multi-mission Azerspace-2/Intelsat 38 communications satellite is successfully performing post-launch maneuvers, following launch aboard an Ariane 5 launch vehicle from the European Spaceport in Kourou, French Guiana. The satellite deployed its solar arrays shortly after launch and will begin firing its main thruster on September 27 to propel toward its final orbit at 45 degrees East. The SSL-built Azerspace-2/Intelsat 38 satellite was successfully launched on September 25 and is performing according to plan. Photo of the satellite post-manufacturing is courtesy of SSL. For Azercosmos, the satellite meets the growing demand for Direct-to-Home (DTH) television, government and network services in Europe, Central and South Asia, the Middle East and Sub-Saharan Africa. This is the second telecommunication satellite for Azercosmos and will expand on the service currently available from Azerspace-1. For Intelsat, the satellite provides continuity of service for the SSL-built Intelsat 12 satellite, launched in 2000. At 45 degrees East, it provides DTH platforms for Central and Eastern Europe as well as the Asia-Pacific region. Intelsat 38 also delivers valuable broadband connectivity for corporate networks and government applications in Africa. The satellite design is based on the highly reliable SSL 1300 satellite platform that provides the flexibility for a broad range of applications and technology advances. 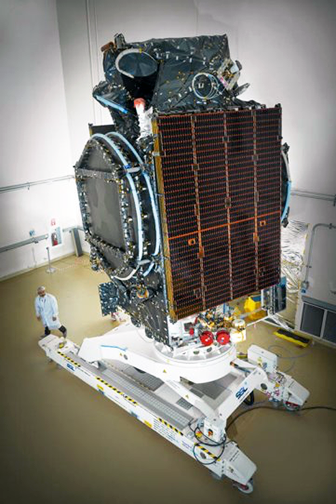 Azerspace-2/Intelsat 38 is designed to provide service for 15 years or more. SSL has built more than 275 satellites over its 60 year history. With this launch, there are now 90 satellites built by SSL in geostationary orbit. Dario Zamarian, Group President of SSL, said that SSL-built satellites such as Azerspace-2/Intelsat 38 help to build a better world, making information and communications more accessible. He thanked Azercosmos and Intelsat for their trust in SSL.as well as the company's teams at SSL and Arianespace for the excellent teamwork and commitment making this launch a success. Rashad Nabiyev, Chairman and Chief Executive Officer of Azercosmos, added that SSL proved to be an excellent and reliable partner to help the company make Azerspace-2 a reality. Now that the satellite has successfully launched, the firm looks forward to providing enhanced service offerings to customers. Ken Lee, Intelsat’s SVP of space, noted that SSL has been a trusted and valued manufacturing partner of Intelsat’s for many years. The company's customers have benefited from their innovative designs and the new Intelsat 38 satellite payload is no exception. The satellite will enable Intelsat's media customers in Central and Eastern Europe and Asia to grow their business and deliver fast, reliable broadband connectivity to corporate enterprise and government customers in Africa.